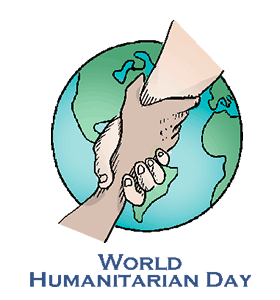 ﻿Humanitarian Day: Calendar, History, Tweets, Facts, Quotes & Activities. World Humanitarian Day seeks to recognize the compassion and bravery of humanitarian workers. The day also serves to gain international cooperation to meet the needs of humanitarian work around the world. Humanitarian workers provide life-saving assistance consisting of first aid, nutrition, shelter and help rebuild after disaster has struck. These workers often battle violence, local diseases and hunger while attempting to save lives and provide relief to those most in need. World Humanitarian Day was designated by the United Nations in December of 2008 in an effort to honor the sacrifices of humanitarian workers. It is celebrated annually on August 19, a day that commemorates the 2003 bombing of the UN Headquarters in Iraq. World Humanitarian Day , August 19, 2018 countless people put themselves at risks in helping those in disasters. Lombok Island has had 5.4 Richter, 6.5 Richter, 7.0 Richter, 5.6 Richter, 5.8 Richter and 5.0 Richter. Just today alone. It is estimated that approximately 22 billion dollars of aid was given worldwide in 2013, though there is no official way to track exactly how much money is spent. The US is the top national donor in terms of raw dollars allocated to humanitarian aid. In 2013 it gave approximately 4.7 billion dollars. However, among developed nations, it donates the lowest percentage of its GDP. Despite all the money and aid that is being given for humanitarian relief, it is still estimated that one-third of all global humanitarian needs are not being met. The UN’s humanitarian agencies rely on charitable donations from the public as well as the generosity of governments to continue their lifesaving work in response to natural disasters, armed conflicts and other emergencies. – Ban Ki-moon, current Secretary-General of the United Nations. Donate to MedShare International. It recycles surplus medical supplies and equipment from hospitals and clinics and redistributes them to healthcare facilities in nations in need. MedShare is rated as one of the best and most efficient charitable organizations in the world. Watch a movie about humanitarian work. Some suggestions are: Hotel Rwanda (2004), The Stoning of Soraya M. (2008), Beyond the Call (2006), Selma (2015), and the Normal Heart (2014). Spread awareness on social media by using the hashtags #WorldHumanitarianDay, #WHD and #Humanitarianwork. Join humanitarian a work project at home or abroad. Try raising money for a cause or volunteering for organizations that work with needy children, war zones, refugees and the old and sick.